Features dozens of comprehensive drawing lessons designed to teach aspiring artists how to draw a variety of animals, from lifelike pet portraits to zoo and safari animals. With helpful tips and easy to follow step-by-step lessons, The Complete Beginner's Guide to Drawing Animals is the perfect resource for artists looking to hone their drawing style and technique. 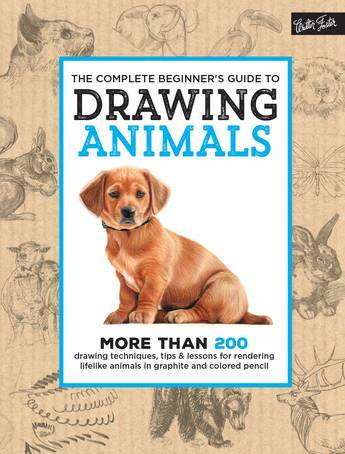 The Complete Beginner's Guide to Drawing Animals starts with a thorough introduction to the essential tools and materials artists need to get started, including different types of pencils, sketchbooks, papers, erasers, and more. This helpful resource features dozens of comprehensive drawing lessons designed to teach aspiring artists how to draw a variety of animals, from lifelike pet portraits to zoo and safari animals. Artists will discover the fundamentals of drawing and techniques for rendering realistic animal textures, such as fur, feathers, whiskers, manes, and hair; creating volume; shading; developing a composition; and mastering perspective, all with the goal of drawing dozens of lifelike animals in graphite and colored pencil.